A lovely lavender spray of flowers lets you share your compassion, hope and beauty with all. Beautifully simple. Beautifully serene. It's the perfect way to send your sincere sympathy. 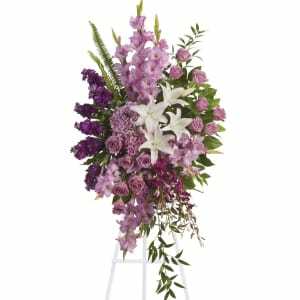 • Lavender, purple and white flowers like hydrangea, orchids, roses, oriental lilies and more create a beautiful spray. • Arrangement measures approximately 26" W X 51" H.
First time I have seen this service on a funeral home site and thought that it was convenient to have were I was looking up information. 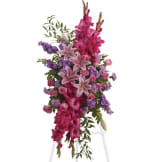 I needed the arrangement at the funeral home the same day that I ordered it. It was there on time and looked beautiful. Exactly what I ordered and there when it needed to be.